In this past week’s episode, we finally got an episode that was not solely focused on one character. At times I don’t mind those episodes, especially when we really end up getting to the root of the character, but on the other hand watching everyone together is part of the magic of the show. This one gave us a look at all the characters and where each one stands at the present moment. I found this episode to be a bit lackluster and drawn out. At the end it did pick up a bit and I am excited for the next one, but considering it was one of the last episodes it was a let down. Let’s discuss this little gem of an episode and break it down by location. At the church, Sasha is chopping wood like a mad woman. Obviously she is still upset about what happened with Bob and she is taking out her aggressions anyway possible. Tyrese keeps looking at her and knows that she is hurting. Father Gabriel seems to be losing his mind, wanting his church to be kept clean, he gets on the floor and starts trying to take the blood stains out of the wood. Gabriel doesn’t agree with what they did when they killed the cannibals. In a sense, he has been so sheltered from the outside world that he doesn’t truly “get it,” that people have to do horrible things in order to live. Humanity has shifted and not everyone can be trusted, people have begun to do bad things to survive like eating other humans and torturing them. This apocalypse has left people mad and maybe in a way Father Gabriel doesn’t even realize that he himself is going crazy. Carl being the wise child that he is, tells Gabriel that he is lucky he even made it this far considering his lack of survival skills. He also tells him he needs to learn how to fight and Michonne intervenes and makes him pick a weapon for himself. He picks a machete, a good choice for him I think. After Daryl and Noah return, Rick decides that they must save Carol. He tells them that they owe her, but really Rick owes her more than anyone else. They decide that they will enter the hospital, go balls to the wall and get Beth and Carol. Tyrese suggests they capture some of the cops as ransom, kidnap them and then make a deal with Dawn to exchange them for the ladies. 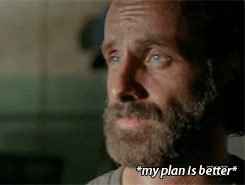 Rick throws that idea out really quick, but then Daryl agrees with Tyrese and they decide to go with Tyrese’s plan. Perhaps Rick’s dictatorship or sense of authority is starting to wear thin on the others, and maybe they are beginning to think that his tactics don’t always work. Back at the church, Gabriel takes the machete he picked and starts taking the floor out and ends up escaping. Out in the woods without a weapon he goes, where he is going no one knows. He approaches a zombie and when he is about to kill her, he sees she’s wearing a cross and he can’t do it. How will Gabriel survive on his own and where is he going? Down at the fire engine road, the group is looking desolate and somewhat dumbfounded about what to do with Eugene. In the last episode, Abraham knocked him out cold when he discovered the truth that Eugene was not a scientist, nor did he have the cure. SHOCKER! I think Abraham wanted to believe in him because that is all he had left in him, if he could fight for Eugene and bring his mission to fruition, then all would be right in the world. Now he is realizing that all of that hope and faith is gone and there is no cure. This leaves Abraham completely out of it, he is not speaking much and looks lost. Rosita encourages to drink water, but he refuses and this just only angers Maggie more. She keeps Eugene out of harms way and covers him up from the sun and is watching to see when he will wake up. Maggie is no rookie and when she sees that Abraham is acting so weird, she puts a gun up to his face and tells him to get over it. At this point, every single person alive has faced losses, so he needs to get over it, otherwise he will die along with everyone else. Tara, Glenn and Rosita go out to search for water. Rosita starts to filter water, using an idea that Eugene taught her. Throughout this episode, Tara tries to be funny with some really dumb jokes, she seems to be the most optimistic of the bunch. On a side note, who thinks Tara and Rosita will soon hook up? Tara also seems to be the most philosophical as of late, she mentions that Eugene used his own intellect to get himself from getting killed, yes he lied, but he did it to survive and can they really be mad at him for trying to keep himself alive? Suddenly in the muddy little swamp area, they find a fish. They end up killing some walkers, taking their jackets off that has a fishnet pocket and using that to capture the fish. I don’t know about you guys, but I thought this was kind of a waste of time. What I did like about this episode from this team aspect, is that we are finally getting to see Rosita as a person, before she was just the girl with Abraham, now we see that she is a force to be reckoned with and she could be a powerful ally in this apocalypse. At the hospital, Beth overhears Dawn talking to some of the staff about taking Carol off life support. Beth speaks up out of the blue and disagrees with their decision. Oddly, Dawn complies with Beth and gives her the key to the drug locker, so she can get the meds for Carol to live. Beth sneaks into the room by offering some guy strawberries to distract the guards and gives Carol the meds and watches over her. That is as much as we get from the Beth and Carol show. Down in the trenches, Rick, Daryl, Noah, Tyrese and Sasha go hunting for cops. All around the hospital are walkers who have somewhat melted to the ground. When they find the cops, one of them almost gets Daryl, he pins him to the ground and tries to get a nearby walker to bite him. Daryl grabs him by the eyeballs like a bowling ball, yanks the head off the body and beats the guy with it. That was a pretty good scene! Then Rick comes and they decide to take all of them hostage. Meanwhile, Sasha and Tyrese have a heart to heart about letting Bob go and to stop being so mad and vengeful. This was a huge mistake in retrospect because it softened her up a bit. Back at the warehouse where they are holding the hostages, one of the cops acts really nice and helpful, saying he will help them get in to find Dawn. At the end he is alone with Sasha, he tells her his name is Bob, obviously he didn’t knkow what she was going trhough, but hearing his name made her a little nicer than she had been acting before. He tells her if she can please shoot his partner who is out there as a zombie, he tells her to get by the window, he’ll point him out and she can shoot him. Big mistake, as she gets to the window, he knocks her out and runs free. SPOILER alert… It was a yo-yo! Seriously TWD?! Agreed! I am so ready for some good stuff to happen. Like seriously a YO-YO that is their extent of creativity?! I’m so much more entertained reading your recaps than actually watching the show. HAHA thanks Mikey! Yes my husband says the same thing, did you see her on the after show? !